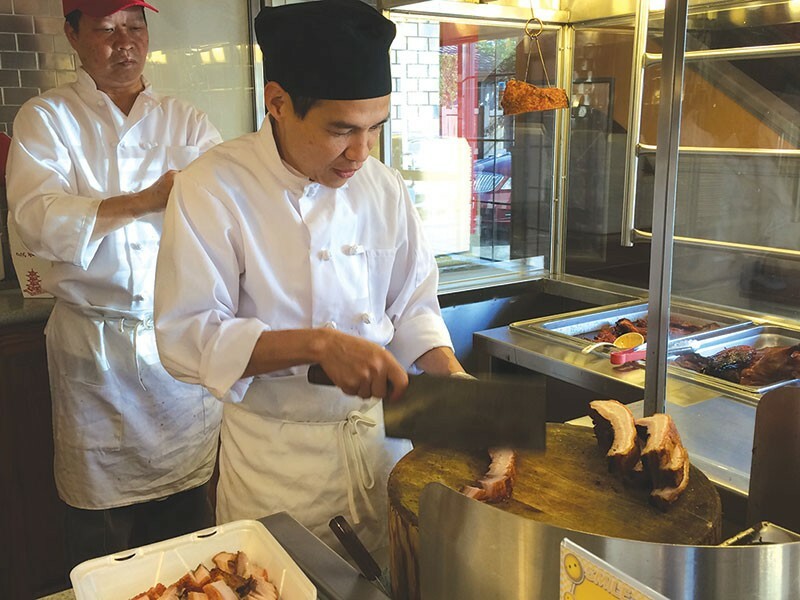 CHOP SOOEY Petaluma’s Fantasy Hong King Style BBQ specializes in the smoky-sweet meats of southern China. The common wisdom used to go something like this: the tackier, more exaggerated a Chinese restaurant's name, the better the food. Words like "Best," "Royal" and "Happy" dominated the scene, complete with iridescent signs and bold fonts, oblivious to current typography trends. These days, tacky seems to be in decline as discreet titles, ironically kitschy interiors and more trend-conscious menus are the new norm. What to make, then, of Petaluma's new Fantasy Hong Kong Style BBQ? Judging by the name and the bright yellow sign, Fantasy is all about old-school charm. Key elements are present: the menu has detailed photographs, there are plastic flowers on the tables, and a buffet offers deep-fried comfort food. In the middle of all this familiarity, however, the eye travels toward the glistening, festive chunks of Chinatown-style char siu pork and poultry hanging in a display window as you enter. The "house specialty" section of barbecued items is Fantasy's contribution to Petaluma's culinary landscape. Our server explained that Hong Kong–style barbecue is prepared using wood smoke and a lengthy curing and drying process, but this being pollution-aware California, the restaurant uses an oven. The flavoring and air-drying are still in place, though, and result in a delicately sweet, smoky and meaty feast. Opting for a combo of two meats ($16.99), we tried the pork belly and the roasted duck. Other choices included spare ribs, roast chicken and pig's ear. Both arrived chopped in bite-sized chunks, the duck bone-in. The belly, with a perfectly crunchy skin and soft, chewy layers of meat and fat, was a standout, which anyone used to falling-apart, savory ramen-style pork belly will love. The duck was delicately flavored and soft, but the skin should have been crunchier. Both paired well with the earthy, fluffy green onion pancakes from the appetizer section served with spicy chile paste and soy sauce for dipping ($4.95). The combo is a clever answer to Peking duck. The chicken and vegetable potstickers ($6.95) were another satisfying appetizer, and provided a nice pause from all the crispiness and chile pepper heat. Along with the barbecue, Fantasy offers a full menu of less adventurous, mainstream Chinese buffet items from sizzling prawns and chow mein to sesame chicken and salt-and-pepper squid. We tried the lemon chicken ($8.95) with a side of brown rice ($1.95) and added a vibrantly green order of broccoli in oyster sauce ($7.95). The broccoli was properly crunchy and delivered a balanced, just-right accompaniment to the meat, but the chicken was less than inspiring, cut too thin and consisted largely of sweet, sticky batter. Noticing a barely touched plate, the staff kindly took it off the bill. The lemon chicken did offer a valuable lesson, however: Fantasy Hong Kong Style BBQ is a place you go when you crave fantastic Hong Kong–style barbecue.